I did it!! I really spent THAT MUCH in the new Dyson Supersonic Hairdryer… yes, it costs $399 (plus taxes). Now that I have had the futuristic hairdryer for four months, I confess my beauty splurge AND I am ready to provide a honest review about it. It came in a beautiful box, which by the way was very sturdy. You can sense the quality of the product, almost instantly. All three, plus, the free for all option of not having any attachment on, gives you one-of-a-kind opportunity to have a variety of styles with just one gadget. Dyson claims that the surface is cool to touch while in use; I must say that it is neither super hot, nor super cool. Just, it won’t damage your hair or burn you. As for styling settings, you will have more options than ever. It has THREE speed settings and FOUR heat settings that you can combine independently for almost endless possibilities. As for power, it has 1600 watts, which is ok. It also, has a cold button and its motor automatically regulate heat 30 times per second, which protects your hair from excess heat damage. 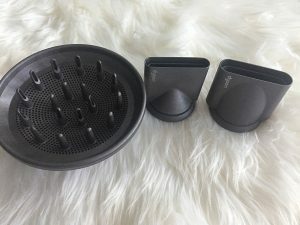 The filter has a removable cap that makes it very easy to clean. And the cable is 9 feet long. It weights 1.8 lbs and is comfortable, because the weight is practically in the lower end, where you hold it. Its quieter than most hairdryers and it has ION, which helps with frizzy hair. Overall, I am very happy with it. The amount of time and effort is not a stress inducer for me anymore. I can dry and style my hair simultaneously in 15-20 minutes (before, I used to spend at least an hour), and believe me, I have a lot of volume and my hair is long and very frizzy. In that note, I find that it does not eliminate my frizz; it just helps a little, but I must use specialised products if I want good results. I believe the Style concentrator is too wide and tends to activate all those little hairs that pop up undesirable. Another downsize is that I plan to travel more and this hairdryer is not going to work universally. So, I must invest in a travel-hairdryer and/or try some heatless styles during vacations. On a last note, I do believe this is the best at home product out there. It is stylish and convenient. I am very proud of my purchase and will continue to use it and learning new styling techniques with it.